Making things with words—that is what Lew Welch did. Early in his career, recently graduated from Reed College (where his friends were the poets Philip Whalen and Gary Snyder), he worked in advertising. The famously laconic and extremely effective four-word slogan “Raid Kills Bugs Dead” is attributed to him, though it is possible that, had he lived long enough to experience the global ecological awakening, he would have regretted lending his brilliance to a pesticide that has deleterious side effects for human and other species’ health. The aphorisms “Raid Kills Bugs Dead” and “Mind is always One” bracket Welch’s life in dynamic and ultimately tragic tension. Though clearly not impervious to the beauties of the world and its spiritual riches, Welch struggled with mental illness and alcoholism for most of his life. In May 1971, he left the rustic shack he’d been living in and walked off into the woods with his dog and his revolver, leaving a suicide note. His body was never found. The mystique that has accrued around him has not necessarily been matched by attention to his work, though Ring of Bone has been in print, albeit sporadically, since the legendary Donald Allen edited and published it through his Four Seasons Foundation in 1973. 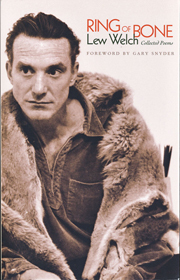 This fortieth-anniversary expanded edition features a new foreword by Gary Snyder, Welch’s former college roommate and longtime poetic and philosophical kindred spirit; the final poetics essay quoted above, which Welch had intended as part of a textbook for a University of California extension course he regularly taught for several years; and a biographical timeline that includes key poetic, professional, and personal phases in the poet’s life. The mind grows in a flickering kind of way. Sometimes an insight comes too early to be fully understood. At other times, we are shocked that it came, being so obvious, so late. . . . The shape of Ring of Bone is circular, or back and forth. Naturally such a form never ends. The principal characters are The Mountain, The City, and The Man who attempts to understand and live with them. The Man changes more than The Mountain and The City, and it appears he will always need both. The poem has the power of a synesthetic vision in which the self is continuous with, or a vessel for, “the clear stream / of all of it” and simultaneously an expression thereof, a sonic representation that responds to impulse and flow like Coleridge’s Aeolian harp, fully immersed in a being / doing that is inseparable from every other being / doing. At the same time, the poem presages a death in which a body’s tissue has disappeared, leaving only the bones at the bottom of a shallow stream. The configuration of the bones affects the stream’s flow, but in ways completely beyond the control or volition of the subject. One traditional Buddhist meditation, the purpose of which is to overcome attachment and understand impermanence, is to visualize one’s dead body decomposing, rotting away to bone, the bone dissolving into dust, etc. Welch takes this as far as he can, yet reserves a special role for the poet so that the bone can be a bell—a functioning, music-making part of the social and natural world. Like that bell, Welch’s work posthumously sounds its contradictions, its urgent seeking with moments of insight, its great attachments to romantic love, drink, camaraderie, language, and intellect, and its unachieved apotheosis as the expression of an untroubled, unified subject.